The “2017 MXA 450 Shootout” was held up for two months as we all waited for the 2017 Honda CRF450 to be released. A tragic earthquake in Japan had damaged the only Honda motorcycle factory in Japan. 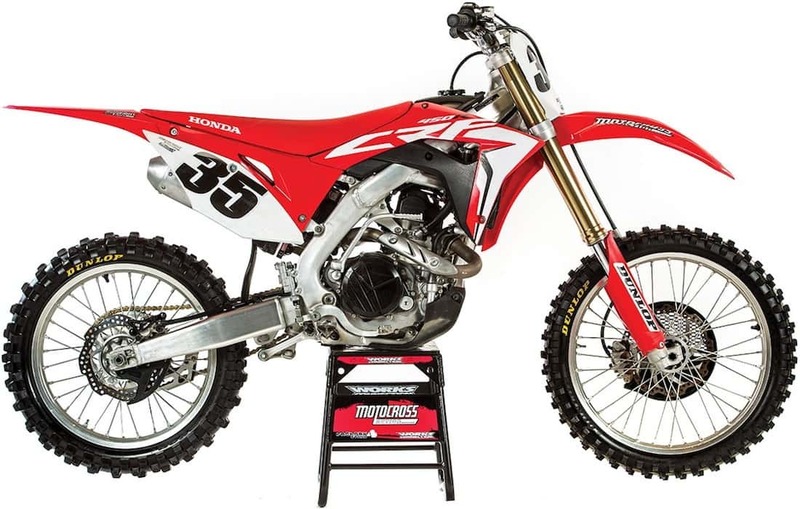 It was closed for three months while repairs were being made—and the MXA wrecking crew had to table its 450 shootout and moved on to the “2017 MXA 250 Four-Stroke Shootout.” Once the 2017 Honda CRF450 arrived, it was all hands on deck. And even though this shootout is long over, we continue to learn more about these bikes every day and race them every week to add to our knowledge base. 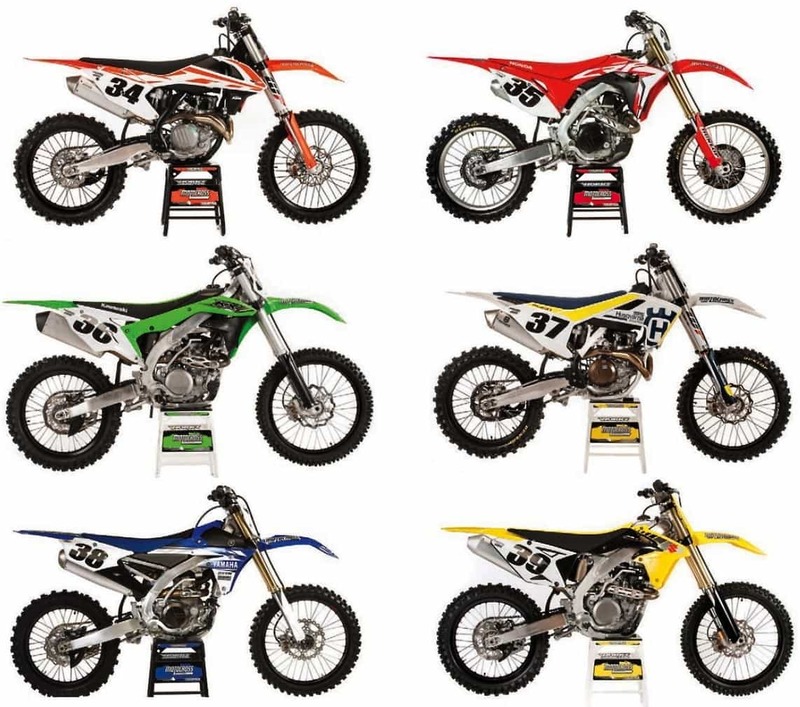 So, without delay, we will rank the six 450 motocross bikes in the order that they deserve. But, don’t let our tastes dictate yours. The best all-around bike might not be the perfect bike for you. We have included links to MXA’s complete bike tests at the end of each bike’s section to provide you with everything you need to know about your bike of choice. The few Suzuki RM-Z450 racers left have been loyal to their brand beyond fault. They have been promised new bikes every year for the past 10 years, but keep getting disappointed on Christmas Day when they open the package and find last year’s bike wrapped up in tinsel and colored ribbon. Overall, the MXA wrecking crew thinks that the RM-Z450 is built on good bones—and those bones are why this bike hasn’t fallen off the face of the earth. The potential is there, but no one at Suzuki seems to want to take the trouble to bring it to the forefront. The Suzuki has finished last in MXA’s 450 shootouts for many years, and it is in the cellar again in 2017. Why? Because it is unchanged from last year. The 2017 RM-Z450 is the victim of benign neglect. All hail the 2018 Suzuki RM-Z450. HOW DOES THE RM-Z450 RATE IN THE MAJOR CATEGORIES? Power output: Very good. The RM-Z450 produces a very clean-running powerband that works best from low to mid. Not fast in the pure sense of the word, but its biggest highlight is that the power is perfectly placed. It makes up for its inherent weakness on top with usable power from the low to mid. A lot of credit goes to how torquey the RM-Z450 feels on the front end of the power curve. It jumps up onto the pipe with a steady metronome style of power that helps you get out of corners a hair quicker than the more powerful bikes. If you just look at the numbers, the RM-Z450 doesn’t set the world on fire, but in the right hands, it is a very good engine. Suspension: Poor. The 2017 Suzuki RM-Z450 has the worst forks of 2017. They remind the MXA test riders of the cement-filled Showa SFF single-spring forks from 2013–2014—only much more complicated to live with. Not a single MXA test rider would volunteer to race the 2017 Suzuki on a rough track unless the stock forks were taken off and buried in a hole. Can you tell that we hate these forks with a passion? We don’t hate the shock, but if the forks don’t work, neither does the shock. Handling: Very good. Suzuki handling is a trade-off. You have to give to get, but for most modern tracks, which aren’t very rough or very fast, but are littered with endless jumps, Suzuki’s turn-at-all-costs philosophy makes it the best-turning bike on the track. However, the price you pay for the RM-Z450’s super-sharp cornering is a twitchiness that elicits gasps from spectators on the sidelines. You gotta give to get. Where is the 2017 Suzuki RM-Z450 at its best? On a hard-packed track with lots of jumps and very few bumps. In these conditions, the forks aren’t stressed, and the chassis is never upset by undulating terrain. Brakes: Poor. In what dimension should the heaviest bike have the worst brakes? Planet Suzuki. When every other Japanese manufacturer gave a half-hearted attempt to close the gap on KTM’s masterful Brembo brakes with bigger front rotors, Suzuki just shrugged. Clutch: Poor. Years ago Suzuki bought into the idea that they could sell more bikes if they made the clutch easier to pull on the showroom floor. So, they put in weak springs that don’t work on dirt, just on linoleum. Weight: Poor. In an imaginary world where the Suzuki RM-Z450 didn’t weigh 240 pounds, the small brake rotor would actually stop the bike, the same engine would be snappier and more responsive, and the suspension would not be trying to hold up a tub of lard. No such place exists. Horsepower: Good. The 2017 engine is identical to the 2016 engine, which was the 2015 engine and, not surprisingly, very similar to the 2014 engine. Peak horsepower is pegged at 54.88 horsepower at 9200 rpm. That makes it the sixth most powerful engine out of the six bikes in this shootout. But, all is not lost. It ranks second overall in low-end power and above Honda and Kawasaki in midrange power. The trouble with the Suzuki RM-Z450 engine is that it is stuck in the past,. It is still tilting against windmills that have long since fallen. Need proof? The 2011 Suzuki RM-Z450 broke the 54-horsepower barrier six years ago. The new Chuck Yeager speed barrier is 58 horsepower. 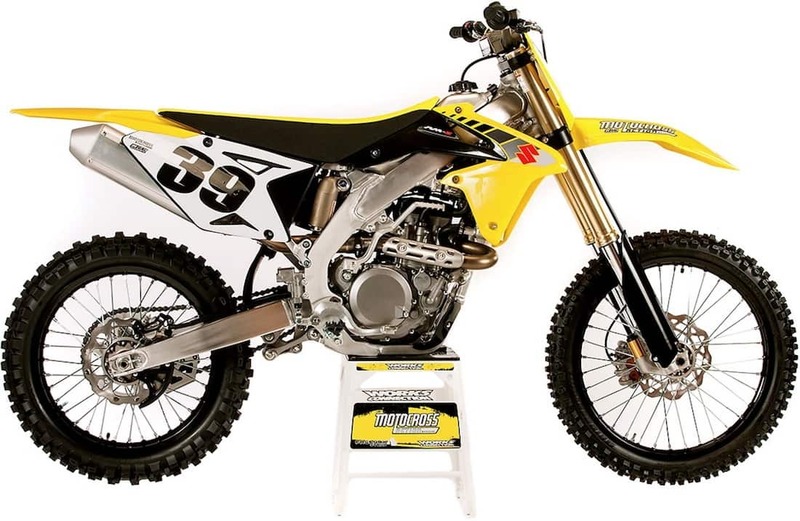 The RM-Z450 has competitive torque at 36.03 foot-pounds, which is better than the CRF450, KX450F, YZ450F and FC450. 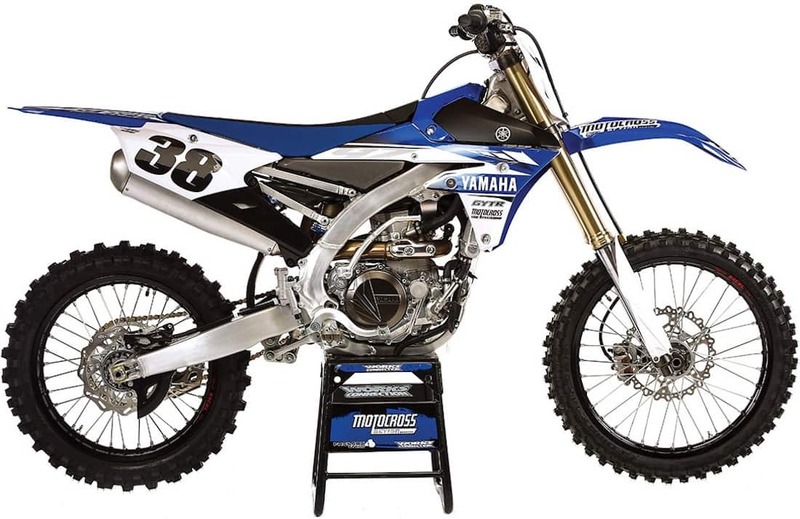 Yamaha never had a chance to win the “2017 MXA 450 Shootout.” The die was cast when the only noticeable change Yamaha made between 2016 and 2017 was to recess the holes in the gas-tank cover where the Dzus fasteners go. You don’t need a degree in plasma physics to see that a bike that finished fourth in the “2016 MXA 450 Shootout” is unlikely to move up in the rankings just because the Dzus fasteners don’t catch on your pants anymore. Yamaha is the most reliable bike on the track. It can take a licking and keep on ticking, but so can a Caterpillar D6. Ever wanted to race one of those? HOW DOES THE YZ450F RATE IN THE MAJOR CATEGORIES? Power output: Very good. You don’t find a lot of mid-to-top powerbands in the ranks of 450 motocross bikes. Normally, a 450cc engine designer is trying to find ways to mellow out the power and move it lower in the powerband. Not Yamaha. They went for the gusto with an engine that pulls harder on top than it does on the bottom. In a straight line the YZ450F is a guided missile that is zeroing in on the next turn. It does its best work beyond 9000 rpm—and in the motocross world 9000 rpm and up is the territory of professional motorcycle racers who are willing to hold it on and leave it on. That doesn’t mean that it can’t be ridden by a Novice or a Vet, just that it won’t live up to all its potential. To the MXA wrecking crew, the best YZ450F strategy is to go richer on the fuel and retard the ignition map. We added a 9-ounce flywheel weight to churn up the powerband, and then geared it down by one tooth with an eye towards getting into third gear sooner. This takes away some of the snarling aggression off the bottom and spreads out the transition into the top. Suspension: Excellent. We are pretty sure that this is what Honda was aiming for when they decided to switch from air forks to coil-spring forks for 2017. Yamaha’s Kayaba SSS components are the gold standard of motocross suspension—and they have been for 11 years. How is it possible that no other company has been able to build better suspension than the stuff that Yamaha started using in 2006? Most of the motorcycle industry spun its wheels in pursuit of air forks and, worse yet, a different air fork every year. Yamaha didn’t go chasing unicorns. Handling: Fair. For most MXA test riders, the Yamaha YZ450F’s handling characteristics are not their cup of tea. We think that it is vague at tip-in, pushes on flat corners, has a hitch in its giddy-up at mid-corner and weighs 238 pounds (but feels like it weighs 239 pounds). MXA has been critical of Yamaha’s front-end response for as long as we can remember. Superb handling has never been Yamaha’s strong point—suspension, yes; cornering, no. Maybe it’s just us, but we find the ergonomics to be weirdly disconcerting. In stock trim, it feels too tall in the rear. It gives the impression that it’s overly wide at the radiators. It feels tippy and top-heavy. It isn’t flat enough for our tastes. And, creative centralization of mass can’t make up for the 16 extras pounds it carries over the KTM 450SXF. Some test riders swicthed triple clamp offset from 25mm to 22mm. We know that if we only raced a YZ450F and never adapted to another brand of bike that the YZ450Fs peccadilloes would seem natural. So, if you own a Yamaha YZ450F, stay off of a KTM. Brakes: Fair. Yamaha brakes have never been class-leading, so when everyone, save for Suzuki, went to 270mm front brake rotors to trump KTM’s 260mm rotor, you would have thought that Yamaha would maintain their status quo. We don’t think so. The Yamaha front brake is grabby and not as well modulated as it could be. Clutch: Very good. For a cable-operated, coil-spring clutch, the YZ450F is the best of the Japanese manufacturers’ offerings. We typically run stiffer clutch springs for added security. Weight: Poor. When KTM knocked 12-1/2 pounds off of the 450SXF in three short years, the “Big Four” were left gasping at the rapid change. With their four-year development cycles, they couldn’t respond, proven by the fact that the 2017 Honda CRF450, the first new bikes released since KTM joined Weight Watchers, didn’t lose a single pound. As for Yamaha, they aren’t the heaviest bike on the track for 2017, but they are much closer to the heaviest than the lightest. Horsepower: Good. Given that the 2017 YZ450F engine package is identical to the 2016 mechanicals, it makes the exact same horsepower—it peaks at 56.85 horsepower at 9800 rpm. That’s solid, but really unchanged mathematically from the 2015 and 2016 engines. In the pecking order of peak horsepower, the YZ450F ranks fourth behind the KTM, Honda and Husqvarna (for comparison, the KTM makes 57.98, Honda 57.49 and Husqvarna 57.14) to Yamaha’s 56.85. Two years ago the 2015 YZ450F was third in the MXA 450 shootout. Last year it dropped to fourth because it didn’t get appreciably improved. This year it drops to fifth for the same reason. Yamaha must see the writing on the wall, and since they are on the fourth year of the YZ450F’s production cycle, we are ready for our yearly chant of “Wait until next year!” The pressing question is whether Yamaha’s product planners are ready to match the technological leaps that KTM took over the last two years. If they are, we are ready. If you are a loyal Honda owner, you are gonna love the 2017 CRF450. Finally, Honda put its “slower is better” philosophy out to pasture and built a much-improved Honda. 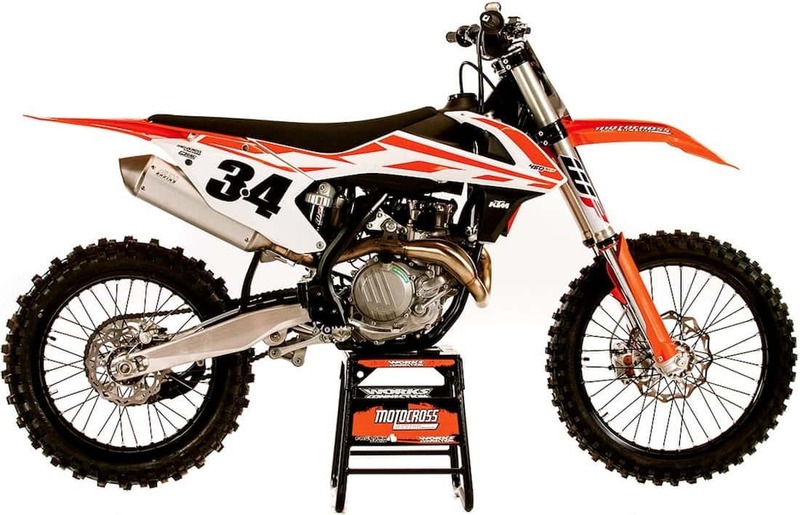 Unfortunately, during Honda’s four-year development cycle, they never expected anyone to build a 222-pound 450, especially one with electric start, a hydraulic clutch, super brakes and air forks that actually work. The CRF450 is a very good bike, it is great bike when compared to the 2016 CRF450, but we had issues with the top end, clutch, radiators, mapping, seat and gearing. HOW DOES THE CRF450 RATE IN THE MAJOR CATEGORIES? Power output: Very good. Even though the midrange is bracketed by an erratic low-end and flat top-end, the way the CRF450 puts the power to the ground is its best trait. It feels supremely hooked up in a way that seems to gobble up ground. On the pipe, in the midrange and with the throttle pegged, this is a great engine. Conversely, it is not a great engine off the bottom. It feels herky-jerky at small throttle openings. Worse yet, our CRF450 suffered a significant horsepower loss early in our test program. We had to readjust the valves and freshen up the top end with a new piston, rings and cylinder to get the power back up to snuff back. This is a bike that is at its best in the midrange, but compared to the last eight years of CR450s, it finally has top-end rev. During our test period we had two valves go tight, the radiator fins roosted shut, had the seat come unhooked when landing from jumps and had the judder spring in the clutch break. Suspension: Fair. Don’t get us wrong; we love that Honda returned to coil-spring forks. It makes life so much more pleasant on a day-to-day basis. And given the heritage of these forks, every suspension tuner in the country has a playbook to make them better. That’s a good thing, because the forks were soft in the first half of their travel before hitting a shelf of compression damping. This combination was unrideable by fast riders and disconcerting for slow riders. We always felt the need to add more rebound to keep them from pogoing up and down. There are clicker settings that iron out some of the bugs, but not all. As for the rear shock, it was more of the same. The CRF450 chassis seemed to want the race sag at 106mm, but the shock didn’t like this much sag and tended to drop in and seesaw back up. Our best fix for the stock forks and shock was to put 0.50 N/m forks springs in the forks and a stiffer 56 N/m shock spring in place of the 54 spring. Handling: Very good. The CRF450 was superb at turn-in, albeit a little loose from center-out. This was aggravated by the ergos that wanted you to sit farther back when you needed to be sitting up front. Compared to the previous 2009–2016 CRF450s, the 2017 model is a Bugatti Veyron. Brakes: Good. After ignoring the performance gains made by Brembo over the last decade, the Japanese manufacturers threw band-aids on their bikes with 270mm rotors. However, they used the same old master cylinders and calipers that were designed for the small rotors. The result is a grab bag of brake performance, with “grabby” being the optimum word. we removed the plastic disc brake guards to help the brakes in long motos. Horsepower: Good. 57.49 horsepower at 9900 rpm. The peak number is impressive as it is only a half horse less than the class-leading KTM 450SXF. The midrange power is very raceable, but we need better mapping to fix the irrtitating throttle response in half-throttle situations. Last year we ended our “2016 MXA 450 Shootout,” in which the 2016 CRF450 finished fifth out of six, by saying, “There’s always next year.” Well, next year is here, and the 2017 Honda has erased our memory of the slow, uninspiring bike that we had to live with for eight long years. If there is a fly in the ointment of the 2017 CRF450, it’s that it is a first-year model, and perhaps the common wisdom about waiting for the second year is good advice. This bike will be so much better when the 2018 Honda gets stiffer shock and fork springs, better fork damping, flatter profile, new low-end mapping, a seat that doesn’t pop out, more protective radiator guards and a decompression release mechanism that doesn’t break. Two years ago we said that if Kawasaki built a lower, lighter and sleeker bike that they could win the “2016 MXA 450 Shootout.” But even though the 2016 Kawasaki KX450F was a lighter, thinner and lower, the MXA wrecking crew reneged on the deal for it to win the 2016 shootout. Why? The 2016 Kawasaki engine had the bad manners to ping when it got hot and pop on deceleration whenever we backed off from full throttle. We were lean and we knew it, but the problem could only be solved with Kawasaki’s $700 reprogramming tool. So, most people relied on the black (rich) plug-in coupler. The pinging stopped, but the overall power was reduced. For 2017 the Kawasaki KX450F comes with the mapping it should have had in 2016. The better EFI mapping made the 2017 KX450F feel stronger in transition off the bottom and into the middle. It wasn’t any more powerful than it was in 2016, but now you can utilize the power to its fullest. HOW DOES THE KX450F RATE IN THE MAJOR CATEGORIES? Power output: Good. Kawasaki has always had a reputation for building the most powerful 450cc engines. There were years when the Kawasaki KX450F won the MXA shootout on the sheer superiority of its engine, despite the rest of the flawed machine. That was the past. For 2017 the KX450F has a solid, linear, easy-to-use powerband. It doesn’t jerk your arms out of the sockets like the fabled 2012 KX450F engine. This is a new-school Kawasaki. Gone is the brutal hit, and in its place is an amazingly smooth engine that allows you to go fast with less effort. We like this engine. Suspension: Good. These are really good air forks. We never thought we would ever say that about Showa TAC forks. Whether we were setting them up for an AMA Pro or a portly Vet Novice, we got them in the sweet spot quickly (in sharp contrast to the SFF TAC forks on the 2017 Suzuki RM-Z450). If you take the time to learn the KX450F’s Showa SFF-TAC air forks, you will find that they are not as scary as they have been made out to be. 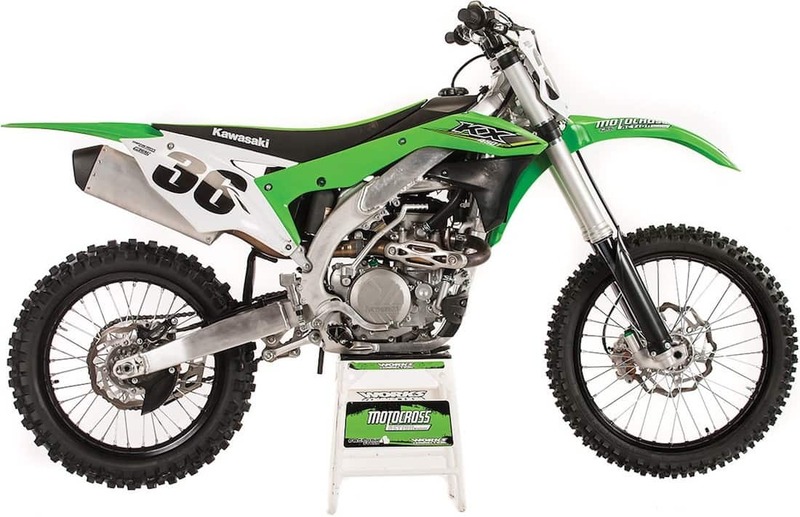 As for the rear shock, Kawasaki lengthened the pull rods by 0.5mm, added a more progressive rising-rate bell crank, which will retrofit on the 2016 model, and increased the opening in the swingarm where the shock goes through for mud clearance. The shock worked well from day one, and although we went out on several settings and ran the race sag at a relatively low 105mm, we liked the improvements to the rear suspension. All in all, we liked Kawasaki’s suspension setup. Handling: Very good. Previous KX450Fs were upright, cranky bikes that required handlebar input to make them turn. We never liked them and always changed the shock linkage, triple-clamp offset and setup to try to compensate for the KX450F’s quirkiness. Not so with the 2017 KX450F. It’s night and day better than the old-school Kawasaki. It wanted to turn and felt light, agile and quick (words we never used to describe a KX450F before 2016). Brakes: Fair. The KX450F 270mm brakes were nothing special, and they still have the same problem they had 20 years ago. The brake fluid has to be changed early in the KX450F’s life, because the brakes feel mushy off the showroom floor. Clutch: Fair. The best fix for the KX450F clutch is to install a Hinson. When we roll the bike out of the shop for the first test run, we have already installed stiffer Pro Circuit clutch springs. Weight: Very good. In the pyramid of weight, the 2017 Kawasaki KX450F ranks third lightest overall but first among Japanese-built bikes. At 231 pounds, the KX450F is 2 pounds lighter than the CRF450, 7 pounds lighter than the YZ450F and 9 pounds lighter than the RM-Z450. It goes without saying, but we will say it anyway—the KX450F weighs 9 pounds more than the KTM 450SXF and 7 pounds more than the Husqvarna FC450. Horsepower: Good. The 2017 Kawasaki KX450F is not a powermonger. Its 55.43 horsepower places it behind the KTM, Husky, Honda and Yamaha on the dyno runs. Its 35.79 foot-pounds of torque doesn’t light up any Roman candles, either, but this is still a very good powerband—not because of the power it makes, but because of the way it delivers that power to the ground. For years we always thought of the KX450F in terms of its powerband and nothing else, because nothing else stood out. For 2017 the changes to the mapping, fork valving, triple clamps, shock spring, rising rate and seat base brought the new-generation KX450F into sharper focus. It’s a bike for everyman not just Pros. It makes motocross easier to do. The 2017 KX450F is as far away from its previous relatives as a bike could get. Given that the 2017 Husqvarna FC450 shares almost all of its major components with the 2017 KTM 450SXF, you might assume that it would tie for first place with its orange brother. After all, it has the same brakes, handling, electric starter, diaphragm clutch, airbox, hubs, air forks and light weight. Those are good reasons to choose the Husqvarna FC450 and KTM 450SXF as the co-winners, but KTM doesn’t want that to happen. We aren’t conspiracy theorists, but there is something fishy in Denmark—by which we mean Mattighofen. For some reason Husqvarna’s engineers have refused to fix the two major complaints that American Husqvarna owners have against the FC450. First, the plastic airbox doesn’t breathe. It didn’t breathe last year and it didn’t breathe the year before. If we were betting men, we would place a fiver that it won’t breathe in 2018, either. Why not? Because if it did let some air into the airbox, it is a sure thing that the Husqvarna engine would run as well as the KTM engine. Second, the Husqvarna FC450 comes with the old, restrictive, ice-cream-cone mufflers that KTM discarded in 2013. They weren’t good enough for KTM in 2014, but suddenly they are okay for Husqvarna in 2017? Apart from the choked-down airbox and choked-up muffler, the 2017 Husqvarna is the 2017 KTM 450SXF. The Husky is still fast and quick, but with a drill and an aftermarket muffler it could be faster and quicker. These two questionable choices cost the FC450 1.0 to 1.25 horsepower at 5000, 6000, 7000, 8000, 9000, 10,000 and 11,000 rpm. It’s one thing to give up one horsepower at peak, but a completely different thing to give up one horsepower at every step on the curve from bottom to top. Also, the airbox and muffler added 2 pounds to the bike, making it the second-lightest bike in this shootout. HOW DOES THE FC450 RATE IN THE MAJOR CATEGORIES? Power output: Very good. Because of the corporate decision to detune the FC450 Husky, it has a lap-time engine, not a sprint engine. Test riders could push the FC450 without fear of being bucked off by a sudden burp of testosterone from the powerplant. This style of power had pluses and minuses. The powerband was long, broad and pulled forever, but without the quick rev and lively throttle response of its KTM sibling. In the end, many MXA test riders thought that the two political decisions made the Husky easier to ride. And, just to be perfectly clear, they can run just like the KTM 450SXF with proper application of a drill bit and new muffler. Handling: Excellent. The KTM 450SXF and Husky FC450 are dream machines. They have a do-it-all chassis. They are stable at speed, ultra-sharp at turn-in and don’t need fancy body English or first-year Pro antics to get them through the switchbacks. 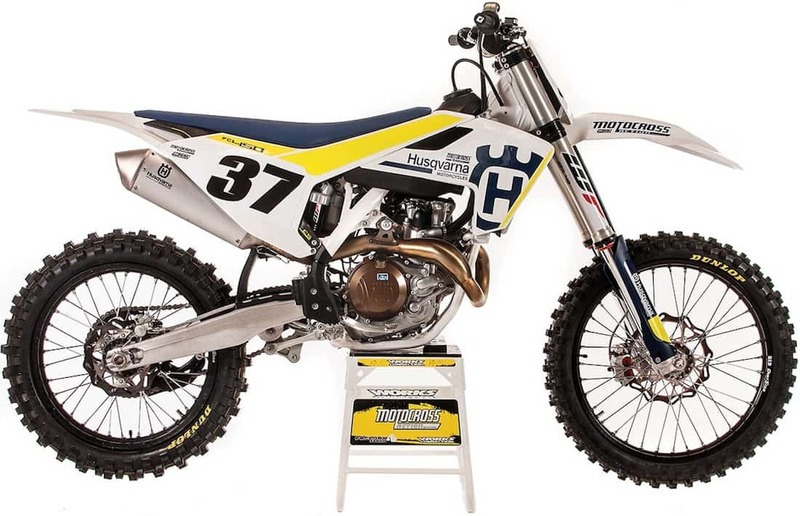 Many MXA test riders think that the Husqvarna chassis is more forgiving because of the flex in the three-piece plastic airbox, which absorbs energy in the rough and over big jumps. Brakes: Excellent. KTM and Husqvarna have the brakes that everybody wants—but appear to be a couple years away from getting close to. The Brembos are one-finger powerful. Clutch: Excellent. How often do you have to replace clutch plates on your rusty but trusty scoot? A Husqvarna diaphragm clutch will last three times longer. Weight: Very, very good. At 224 pounds, the Husqvarna weighs 2 pounds more than the KTM 450SXF. The source of the added pounds is the three-piece plastic airbox, ice-cream-cone perf core and heavier GFK brake rotors. It should be noted that 224 pounds is still 7 pounds less than the lightest Japanese 450. Horsepower: Very, very good. The 2017 Husqvarna FC450 makes 57.14 horsepower at peak‚ which is 0.78 horses less than the class-leading KTM 450SXF and 0.35 horses less than the 2017 Honda CRF450. Don’t sniff at that number, because the Husky makes more power than the YZ450F, KX450F, and RM-Z450 (and a more power than the 2017 CRF450 from 6000 rpm to 9500 rpm). The KTM 450SXF and the Husqvarna FC450 are twins. They are the lightest, most powerful, best-stopping, easiest-starting, best-suspended, most flawless handling bikes ever sold. These twins are mirror images of each other. That said, as glad as we are that Husqvarna tried to carve out a niche of their own with their molded airbox and quiet muffler, we didn’t like the side effects of these changes. Thus, we rate the Husky second and the KTM first. Simple fact: If this bike doesn’t win every 2017 shootout, it got robbed. No bike ever built has enjoyed such superiority over its competitors. Think about it. It has a hydraulic clutch. It has the best brakes. It makes the most torque. It makes the most horsepower. It has the broadest powerband. It has multiple maps, launch control and traction control switches on the handlebars. It has quick-release fuel lines. It has rubber-mounted bars. It has plastic frame guards to protect the frame’s paint. It has direct-connect throttle cables to reduce lag time. It is the lightest bike on the showroom floors—in some cases, 18 pounds lighter. It has the best handling of any bike on the track. It has an air filter that requires no tools to remove. It has…well, you get the idea. HOW DOES THE KTM 450SXF RATE IN THE MAJOR CATEGORIES? Power output: Excellent. The KTM 450SXF’s powerband pulls longer than any other engine on the track. It comes out of the gate in second gear and just keeps churning. When the other bikes have to shift, the KTM still has power to spare. At over 57.98 horsepower, it is no slouch, but it’s not the amount of power that the 450SXF engine makes; instead, it is the luscious, long, optimally usable power that draws the rave reviews. This is a different kind of power from what the other brands offer. It doesn’t blast power as much as it oozes it. The five-speed gearbox is bulletproof. Suspension: Excellent. WP forks have been the weak link in KTM’s chain for decades, but they hit a home run with the new AER air forks. The new forks are 3.6 pounds lighter than the 4CS forks they replaced. The AER forks are the best iteration of air technology on the track. In the rear, KTM refined their valving and lowered the shock spring rate from 48N/m to 45N/m, which suits a wider range of riders. Handling: Excellent. The KTM 450SXF is the best all-around-handling bike on the track. It handles instinctively. You just have to think about choosing a line and it takes it. Brakes: Excellent. KTM has never stopped developing its Brembo brake system. Every year they change the brake-pad material or the piston size or reconfigure the hydraulics. Why do they go to all of that trouble when they already have the best brakes on the track. That’s how you stay ahead of the competition. If you never raced with KTM brakes, be forewarned that they will stop you in your tracks if you pull on them the way you grab your KX-F, YZ-F, CRF or RM-Z brakes. Clutch: Excellent. There are people who don’t like the feel of hydraulic clutches, but KTM’s diaphragm clutch goes way beyond personal taste. Its steel clutch basket can never get notchy. The Belleville washer provides even pressure across the complete clutch pack. Riders who burn up KX450F, CRF450 or RM-Z450 clutches in one or two motos will go months on KTM’s plates. This is a clutch designed for the ham-fisted among us. Weight: Excellent. They said it couldn’t be done. Heck, we said it couldn’t be done, but KTM knocked 12.5 pounds off their motocross bikes a three-year span. When they were done with the diet, the KTM 450SXF was lighter than half of the 250cc four-strokes made. Horsepower: Excellent. No need for hyperbole. At 57.98 horsepower the KTM doesn’t just make the most peak horsepower, but it makes the most horsepower at 6000 rpm, 8000 rpm and peak rpm. The icing on the cake is that its 36.53 foot-pounds of torque is the most of any 450cc production bike. The benefit of having the most horsepower is that every rider can choose to use it the way he wants. A Vet can lug it through the corners, a Beginner can stay in one gear around the whole track and a Pro can use all the power that’s available. The 2017 KTM 450SXF proves that powerful engines don’t need to be detuned to make them easy to ride. The KTM 450SXF has the perfect powerband for riders from Beginners to National Champions. It is not our intent to write a love letter about the 2017 KTM 450SXF—and its no secret that we wrote hit pieces on the KTMs that came before the new generation. We aren’t in love as much as fascinated by how one little Austrian company could take on the Japanese juggernauts and do to them what Suzuki, Yamaha, Kawasaki and Honda did to Bultaco, Maico, Ossa, Montesa and BSA back in the 1970s. What goes around comes around. This is the best 450cc bike of 2017.